Jharkhand Secretariat Lower Division invites Application from all the Indian Citizens for the posts of Stenographer on permanent Basis. It is a golden opportunity for all the interested applicants who are looking for jobs in Government Department in Jharkhand State & are eligible to apply for these Posts in Jharkhand Secretariat Lower Division. 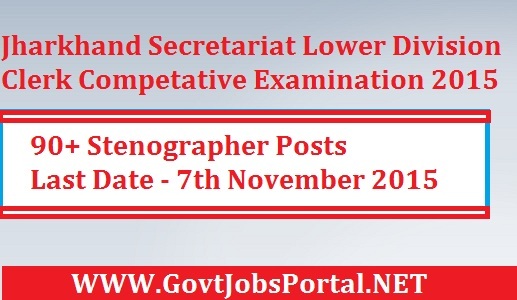 All the Interested Candidates can apply for this Clerk Competitive Examination process online Till 7th November 2015. Below in this post we are providing you the complete detail regarding this Recruitment. Read the complete detail carefully & apply for the required post if you are eligible to apply. Academic Qualification : Candidates should have done Graduation/Degree from any recognized institute/board. Age Limit : Applicants Age should be between 18 to 35 years. Selection Process :Selection will be made on the base of Written Examination and Typing Test. How to Apply : Interested Applicants may apply online through their official website www.jssc.in before 7th November 2015. Applicants can also apply direct from the link that we provided below.